Planning your wedding transportation schedule can be a daunting task, but feel free to use these tips to plan like a rockstar and get everyone to the party on time! Call us for an expert solution to your important day. 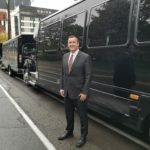 We are a local limousine and bus company operating in the Seattle Area.